I do a lot of pickling and preserving, and I do it for many reasons: To capture abundance, to hold onto seasons past, to transform good into great. It is this last that drives me. Most preserved foods do not outshine their fresh state. Some can be just as good, only different. But a precious few foods undergo a magical transmogrification when they are preserved. Fresh pork leg transformed into prosciutto is a classic example. As are wine and cheese from grapes and milk. So too with fresh garlic. No matter how much I love fresh garlic, it is but a shadow of these preserved cloves. Eating them for the first time was a revelation, a culinary epiphany: I must have this garlic on hand. Always. I did not come up with this method of preserving garlic myself. It comes from my colleague Paul Virant, a fellow traveler, cook and preservation junkie who did me the honor of hosting a Hunt, Gather, Cook dinner at his Michelin-starred restaurant Vie in Chicago last fall. It was a wonderful dinner, but Paul was just as eager to show me his preservation sanctum sanctorum, tucked away in an unused room above the restaurant. Walls of jarred deliciousness rested there. Fruits, green things, sauerkraut. Beets of all shapes and sizes. And a set of jars in the corner stuffed with what looked like roasted garlic. 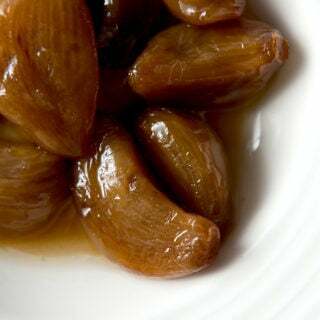 Paul remarked that they were pressure-canned hardneck garlic cloves; hardneck garlic doesn’t store as well as the typical softneck you get in the supermarket, but it is vastly superior in flavor. So Paul puts up jars and jars of the stuff. But Paul goes where most other canning books fear to tread: He delves into pressure canning. This preserved garlic cannot be made without a pressure canner. 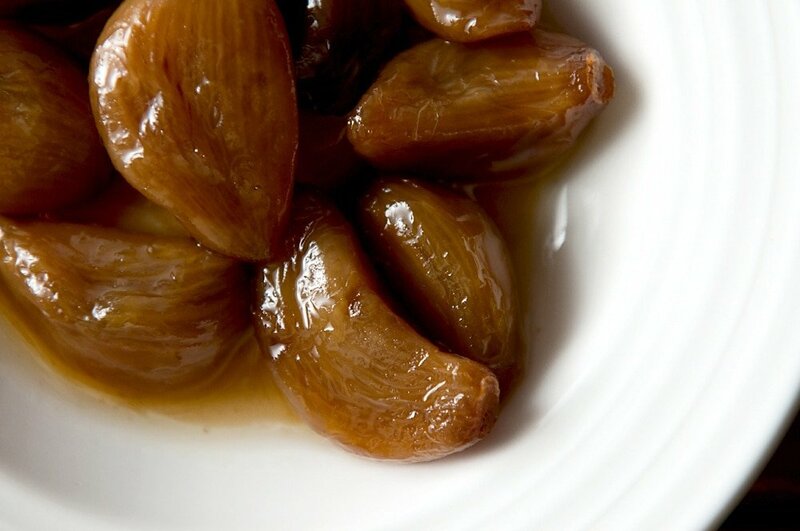 I simply don’t have words to describe how wonderful this stuff is — imagine roasted garlic that holds its shape, sweet, savory, soft, unctuous and just salty enough for you to want to eat another. And another. I like to put a few cloves on a plate with other things, as an accent. Or you can spread them on bread. Or toss them in with eggs in the morning. They are a fantastic addition to a pan sauce. I am posting this now because it is garlic season in most of the country. Fresh garlic is all over farmer’s markets now, and while all fresh garlic is excellent, use the hardneck variety if you can find it. It has a hard central stalk in the middle, and its cloves tend to be larger than those of a softneck. The only other hurdle here is the pressure canner. If you are a hunter, angler, gardener, forager or cook, you really need to get one. They will change your life, in a good way. And all those stories of them exploding are from the 1950s. Modern pressure canners are safe and sturdy. Follow the directions carefully and you will be fine. I admit to being nervous about using the pressure canner the first few times, but I got over it. 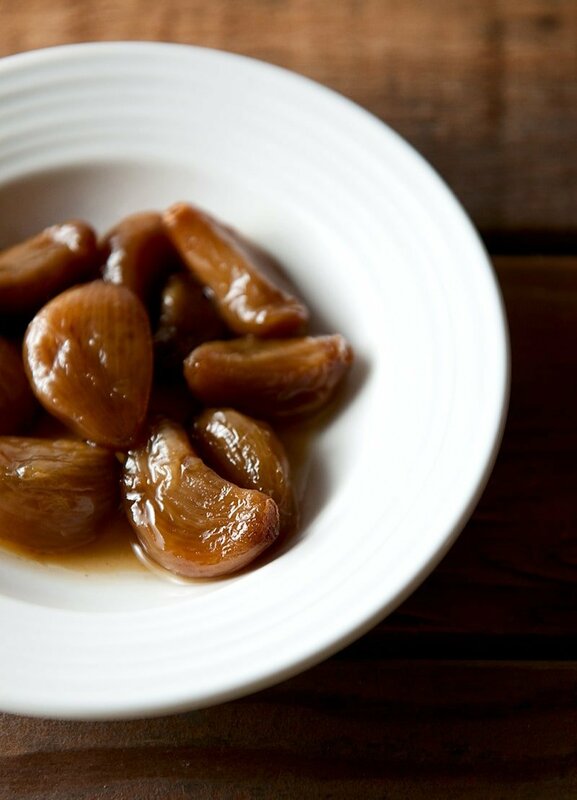 If you make this preserved garlic, I guarantee you will, too. You will need a pressure canner and lots of garlic to make this recipe. 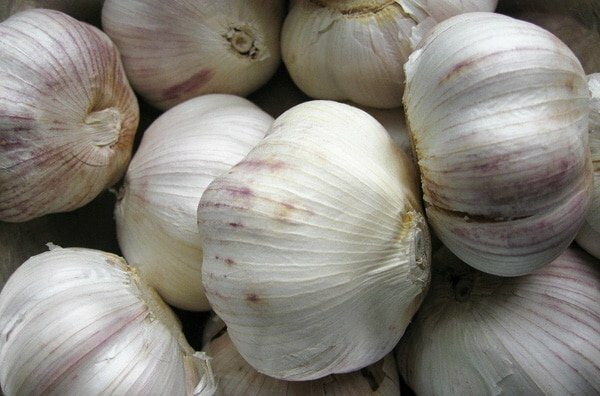 I recommend that you grow your own garlic or buy it at a farmer's market, but any garlic will work. Make this in small jars, as a few cloves go a long way in the flavor department. Half-pints are best, and don't go larger than a pint. Using anything larger than a pint could mess up the sealing process -- pressure canning recipes are designed for size and time, so changing the size of a jar can screw up the calculus. Stick to half-pints and pints. Turn your oven to 220°F. Place 5 half-pint jars on a baking tray in the oven. (Use clean, unused lids for this recipe.) This will sterilize everything. I always put an extra jar in because yields can be variable; large garlic cloves can change things, so it's best to be ready for extra. In a large saute pan, heat the oil and cook the garlic cloves over medium heat. Sprinkle the salt over them. Cook, stirring often, until they begin to brown. This can take anywhere from 8 to 20 minutes, depending on the heat you're using and how moist the garlic cloves are. Once they are starting to brown, mix the sugar into the pan and continue to cook until it begins to caramelize, about 2-5 minutes. Add the vinegar, turn up the heat to medium-high, and cook this down for a minute or two. Remove the jars from the oven. Pack the garlic and the oil and juices into the jars. Leave 1 inch of headspace. Wipe the rims of the jars and seal. Put your pressure canner on your most powerful burner. Use your finger to wipe a film of oil around the inner edge of the canner, as this will help create an airtight seal; read your canner's directions for more detail on this. Get your tap water as hot as it will go and pour enough water into the pressure canner to come up about 2 inches. Put the jars of garlic into the canner and follow its directions to seal the canner. Turn off the heat and allow the PSI to return to zero before taking the weight off the steam vent. Carefully open the canner, making sure you don't get scalded by the steam. Left out the jars and let them cool before storing them in the pantry. Once you make these, the garlic should store in the shelf for a year or more. Keep the jars in the fridge once you've opened them. Want a great recipe using these cloves? Try my Braised Venison Shank with Garlic. Hi Hank, Im a total newbie at pressure canning. I have a couple of questions, didn’t think to add them yesterday. I’m confused as to when to start timing for the 7 min. venting . Do I need to wait to see steam coming out then start timing or start timing right away. I was wondering if its possible to cut back on the salt? Not sure if it would matter. Thelma: You start timing the 7 minute venting when the steam is vigorously coming out of the vent, not before. And yes, with pressure canning you can cut back on the salt. Hi Hank! Thank you so much! I am making this right now, I’m on batch 2 ! I do love this recipe and the flavour is amazing! The 1st batch leaked some oil, they had 1 inch headspace in 1/2 pint jars , they have sealed, do I need to worry? I used the basic ball jars with flat lids and rings, just sealing them till snug not overly tight. Do you think I need to do anything different to avoid this?